Thrive.N is a MUST have BuildASoil Top Seller. FREE SHIPPING on all Thrive.N! If you haven't tried it yet, this is our premium replacement to Pure Protien Dry. Everyone we turn onto the product raves about it and we think you will love it to. Extremely cost effective. 1lb replaces 5-7 Gallons of Liquid Fish Hydrolysate and adds to up to a huge cost savings. Using at recommended dosage for flowering, 1 bag makes 454 gallons of liquid. Thrive.N is a high Nitrogen, fish based fertilizer that promotes vigorous growth, optimum health and higher yields. Being 100% water soluble and rich in amino acids, Thrive.N allows plants to absorb nutrients efficiently and immediately. Whether you're a commercial hydroponic grower, run a small organic farm or a weekend gardener, Thrive.N is the perfect organic solution for all growing applications. 79.28% Amino Acids; 59.56% in Protein Form and 19.73% in Free Form. The best of both worlds. Free Form Amino Acids allow plants to absorb nutrients immediately whereas Protein Form offers a longer release. Give your plants both a quick boost and a steady uptake. Don't let the High Nitrogen Number scare you away, this product is unlike anything else on the market and will not burn your plants. The hydrolyzed fish protein is cold processed and freeze-dried into 100% water-soluble powder. 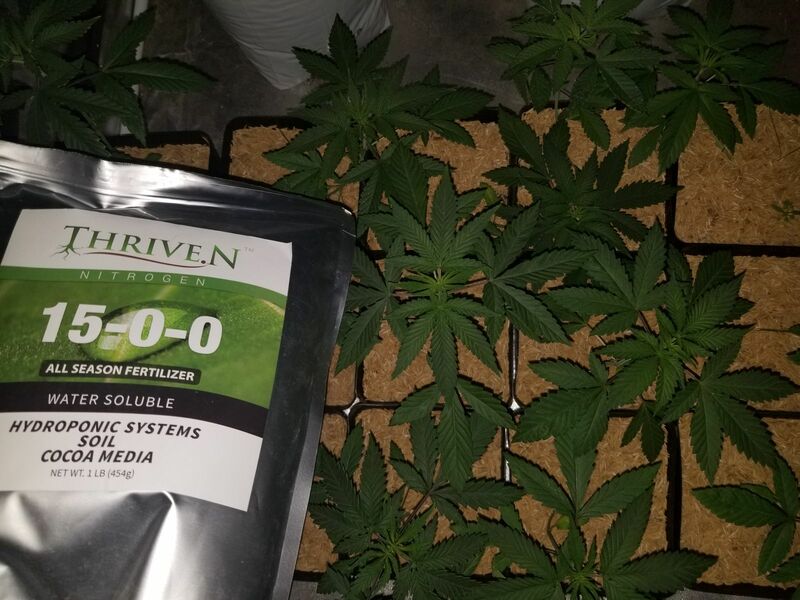 Thrive.N can be used to with any irrigation system, foliar sprays, hydroponics, aeroponics, compost teas and any other method that requires liquid application. Thrive.N - Bloom is manufactured by the same killer crew and is one of our bestsellers. The difference? Thrive.N is 15-0-0 and this product just tested at 2-10-5 which is a HUGE number to hit for organic products. We have been searching for a product that will provide available P and K in balance to the plants for years without going to guano, Phosphoric acid or some other product that didn't fit the bill. The reason it works? The Thrive.N Freeze Dried Fish aminos actually chelate the specialty manufactured product and make the P more available. The results are stunning plant growth and well balanced product that will work through drip lines and foliar sprays. Ingredients of Thrive.N - Bloom: Premium Freeze Dried Fish Hydrolysate, Micronized Cal-Phos, Soluble Seaweed Extract and Sulfate of Potash. All these ingredients combine to make the ideal availability of organic P for your plants in balance with N and K and Ca. Most recent analysis shows immediately available 2-10-5 with about 2% calcium. Add 2 tablespoons per 5 gallons of tea at the beginning of the brewing process. Use at rate of 1-2 lbs per acre or 1-2 tablespoons per gallon water. Living soil: 1-2 teaspoons per gallon of water. Soil-less/hydro: 1-2 tablespoons per gallon of water. Foliar: 1-2 teaspoons per gallon. Dimensions: 7.25" x 5.75" x 2.5"
Dimensions: 8" x 7.25" x 3.5"
chris l. Reviewed by chris l.
This feed works great! Using this and their bloom formula has brought out terp profiles I've never smelled in my plants. Everything tastes and smells better, veggies too! Joe G. Reviewed by Joe G.
Misted underside of leaves and lightly on topside at 1/2 strength - plant was 30 days old, - 80 day strain ..... within 24 hours you could see noticeable growth and color change to a nice almost wax plant green on the older leaves and a brighter green on new growth ..... After 5 weeks of use both in spray and water I’ve noticed stronger stems .... Still incorporating into waterings but at 1/5 strength as we are getting close to harvest, 4 weeks to go. Will use on vegetables and do side by side but early vote favors using again plus trust in BuildaSoil gives it five star rating! Jesse A. Reviewed by Jesse A.